Organized at the Jacob K Javits Centre from January 25 to January 27, the New York Times Travel Show considered the biggest in North America, had Uganda represented by a delegation led by departing Uganda Tourism Board (UTB) CEO Stephen Asiimwe, Uganda�s Market Destination Representative in North America (PHG Group) and eight Ugandan tour operators. 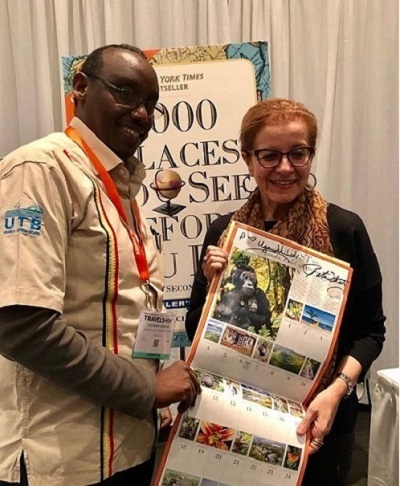 The event brought together over 610 exhibitors from over 170 destinations, which provided the perfect opportunity to market Uganda as well as enhance her visibility and increase the Pearl of Africa's share of US Outbound travel market. It's at this three-day New York Travel Show that US, acclaimed best-seller writer Patricia Schultz unveiled the 1,000 Places to See Before You Die. 1,000 Places to See Before You Die curates the world for people who are passionate about travel and eager to learn more. A 1 New York Times bestseller that redefines the travel guide, this compellingly written, obsessively researched, and deeply satisfying book�introduces a new way of thinking about a life list of experiences. UTB outgoing CEO Dr. Stephen Asiimwe called it a "breakthrough", adding that, "Out of the 1,000, Uganda made it to the top 12 in the calendar." "We are steadily positioning Uganda as a preferred tourist destination in Africa and soon, we will have a bigger share of international tourists visiting Africa," said Asiimwe. Schultz's article presented Uganda as a primate destination, with its narrow valleys and lush, steep slopes of southwestern Uganda being home to the legendary mountain gorillas � with half of the world's mountain gorilla population living in Bwindi Impenetrable Forest (and the remainder in neighboring Rwanda and the DR Congo). Unlike their lowland cousins to the west, the mountain gorillas cannot survive in captivity, so wildlife enthusiasts must make the trek to see them � it is not an easy nor inexpensive one. But with special date-specific permits arranged in advance, groups of 8 trekkers are accompanied by trackers, armed guides and a park ranger and are able to spend a brief but unforgettable hour with a silver-back gorilla and his family in the wild. Uganda, which Winston Churchill famously referred to as "the pearl of Africa," offers far more than face time with these magnificent creatures. Bwindi is also home to a variety of birdlife (with more than 350 species it is one of the most exciting destinations in Africa) and 11 species of primates, such as baboons, chimpanzees, vervet and colobus monkeys and 120 other species of mammal. But the magic of safari isn�t all that Uganda has to offer. For the more intrepid adventures a climb to the snow-capped legendary mountains of the moon � Mt. Rwenzori are a must for the daring.